Thoughts on poker and software design from Alex Scott. One of the first things that I wanted to accomplish after I joined the Full Tilt Poker team in February 2011 was to revamp and simplify the loyalty schemes that the company offered to its players. When I joined, the loyalty program consisted of several diverse elements that had evolved over time, and were somewhat fragmented and distinct from each other. The Iron Man Challenge, which rewarded players for playing on a regular basis. Unlike many other promotions, Iron Man didn't simply focus on high-volume play, but also rewarded players for coming back to the site frequently, even if they only played a little. Rakeback, which was a form of cashback promotion, with the amount of rakeback generally set at 27% of the net revenue generated by the player. Rakeback was enormously complex because of the non-transparent way in which revenue was calculated (with a complicated rake attribution mechanism and numerous deductions from the gross revenue). It was impossible for a player to reliably estimate their rakeback in advance because of these complications. In addition, rakeback was only given to players who had joined the site through certain affiliates, meaning that the majority of players did not have access to it. Rakeback was also the root cause of some common security problems. Full Tilt Points (FTPs), which were a reward that players could spend on various items in a loyalty store. Black Card, a relatively new promotion that rewarded very high-volume players with bonus points and other benefits, based on the number of FTPs they earned during a rolling 100-day period. I felt that the many separate elements made the overall rewards scheme difficult to understand and advocated switching to a unified system based on rolling averages, like Black Card. As we were planning to relaunch the Full Tilt Poker brand under the new ownership of Groupe Bernard Tapie in late 2011, we had a unique opportunity to change the rewards system, and so we began to design a unified system based around extending Black Card downwards. The system had to compete effectively against our anticipated closest competitors. We identified several weaknesses in competing loyalty programs and aimed to address them in our own. The competing programs had several traps for players which could cause them to lose out on value - a common trap being that the system was based on calendar months and years, meaning that if you started playing late in the month or year it was much harder to qualify for a VIP status than it was if you started early. Since the majority of people are paid in the last week of the month and this is when most deposits are made, this meant that many players felt disenfranchised by such programs. We decided to base our own system around the rolling periods, which had worked well for Black Card and avoided this problem. Another common trap in competing programs is that in order to get any cash for your play, you must spend the points you have earned through playing on cash rewards in the VIP store. If you spend your points on the 'wrong' items, you get significantly less cash value than you would otherwise. We decided to avoid this issue in our own program, by not requiring players to spend points in the store to get their cash rewards. Our new system was divided into several tiers. To keep the nice aspect of Iron Man, where you could qualify by playing little and often or by playing a lot but less often, you could qualify for each tier in the new program by maintaining an average level of play over 7, 30, or 100 days. Once you reached the appropriate tier, you would begin earning a cash reward which would be paid on a weekly basis - much like rakeback, except available to all players and without any deductions. The size of the cash reward varied depending on how much you played and your tier within the program, and you could track it in real time in the client as it accumulated. We were the first poker site to allow the player to choose the day of the week on which their weekly reward was paid, and the first to provide detailed tools allowing the player to measure their past level of play, and make projections about what level they would reach in the future. My working title 'Edge' (which is a synonym for 'advantage' in poker terminology) was selected as the name for the program, with 'Edge Reward' becoming the name for the weekly cashback reward. With Edge, we were actually able to increase the rewards on offer (the highest tier offered cashback of 25% of gross revenue plus FTPs, which was significantly higher than the 27% of net revenue offered previously) while simultaneously making cash rewards available to all players, and not just a select few. I'm very proud of the product that Edge became - we made very few compromises to bring it to market*, and in my opinion it improved significantly on the existing Iron Man and rakeback systems while also competing effectively against the other loyalty programs in the marketplace. *Some minor changes were made to Edge after my departure Full Tilt Poker was acquired by the Rational Group, but for reasons of confidentiality they cannot be discussed here. Almost all online poker sites allow you to take notes on your opponents, so you can remember how they play from session to session. Along with the Ongame network, Full Tilt Poker was one of the first poker sites to offer a category selection feature (in the form of colours) that allowed you to quickly get a feel for the opponents you were facing. The system worked from a modeless pop-up accessed via the right-click menu of your opponent, and required at least three clicks in total - one to open the dialog, another to select the colour from a drop-down menu, and a further click to save and exit. Over time it became very common for players to simply categorise players without making an accompanying text note, so we decided to improve the user experience by making it possible to easily colour code a player without needing the pop-up dialog. My idea was to place all of the colours in a grid within the right-click menu itself, meaning that only a single click of the mouse was required to select a category for your opponent. This simple solution had virtually no risk and yet improved the user experience dramatically for those who regularly colour-code their opponents. In a live poker game, you can usually only play at one table at any given time for reasons that should be evident. However, online there is no such restriction. You can play two, four, eight or even twenty-four tables at the same time if you wish. In fact it is fairly common for players on sites like PokerStars to 'multi-table' - on average, 10% of active unique players are playing 2 or more tables at any given time. This has obvious benefits for both the operator and the player (as long as the player is a winner). The severity of the problem was highlighted by a comparison that I performed between PokerStars (which limited players to a maximum of 24 tables by default) and it's nearest rival Full Tilt Poker (which limited players to a maximum of 8 tables by default, with this increased to 16 on request). For standard No Limit Hold'em full-ring games, Full Tilt Poker dealt 33% more hands per hour, despite the fact that more players saw the flop on average (meaning that more events occurred per hand). In fact, a 'normal' speed table on Full Tilt Poker dealt slightly more hands per hour than a 'fast' speed table on PokerStars. This was a startling statistic which needed to be explained. Some of the discrepancy could be explained by differences in software. 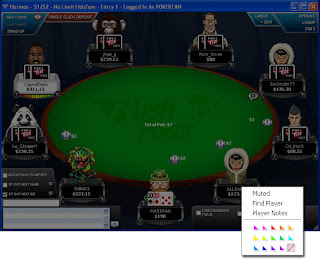 For example, Full Tilt Poker allowed players less time to act, and had faster card-dealing animation. Accordingly, during my time at PokerStars I designed a number of changes to the software to speed up the games (and these were continued by my successors after I left). But clearly differences in software alone could not account for such a major variation in game speed - nor could they explain the many complaints that we would receive from recreational players who wanted to introduce games where multi-tablers weren't allowed, because of slow play. The answer was rooted in the Peter Principle. Multi-tablers typically push themselves too far, increasing the number of tables they are playing until they are playing more than they could really handle. Once somebody feels comfortable at, say 8 tables, it is very difficult to convince them that they should play fewer. Often they won't realise that they are slowing the game down, and even if they do, human selfishness means that they are unlikely to give up the possibility of extra profit or rewards and cut back on their tables to improve the experience of others. On the other hand, there were a few multi-tablers who were able to play 24 tables without causing delays, and were capable of playing even more, but were limited to a maximum of 24. The problem was that the existing 24-table limit was fixed in stone, and bore no relation whatsoever to how capable a multi-tabler a person actually was. People are different - one player might struggle to play 4 tables without slowing the game, while another can play 24 tables easily without causing a significant delay. The only real solution, therefore, is to have a table cap that is different for each player, and which takes into account how capable the player is of multi-tabling without causing delays. It turns out that the average time it takes for a player to respond (to take an action when it is their turn) is about 4.5 seconds. Clearly, if somebody can maintain that speed or better while playing at 24 tables, they should be allowed to play more. However, if somebody is exceeding that time by a significant margin on a regular basis, chances are that they are playing more tables than they can really handle and their table cap should be reduced so that they don't make the game an unpleasant experience for their opponents. Because nothing like this had been done before in online poker, I designed a configurable rules-based system. Administrators could define a rule like 'If a player's action time is greater than 11000 milliseconds, and they are playing at 10 or more tables, and their existing cap is 10 or higher, then decrease their table cap by 2'. This allowed the company to roll out the system gradually and silently so that they could see the effect that the changes would have in advance of them actually being implemented. Dynamic Table Limits were rolled out at PokerStars after I left the company in July 2010, and at the time of writing it appears that they are being used quite conservatively (understandable, since some players are not going to like having their table limits reduced). However I expect the system to have a major positive impact on the quality and speed of ring games online in the coming years. A common problem that occurred on PokerStars in 2008 was that you would try to enter a tournament that had a maximum number of entrants (for example, a Sit & Go with a maximum of 9 players), but by the time you had completed the registration process, the tournament had filled up and started, so your registration failed. This was very frustrating for customers who were interested in tournaments that filled very quickly, such as low-stakes or play money STTs. To counter this problem, I designed a feature whereby the player was offered the opportunity to register in the next available identical event if the tournament had filled up by the time they completed their registration. This allowed the customer to register for a game on the first attempt every time, a huge improvement to usability. It's mid-2008. PokerStars is well-known for its wide selection of tournaments. In fact, there are now thousands of different tournaments every single day, and it is becoming difficult to easily find the ones that interest you in amongst the rabble of tournaments that don't. The simplest way to find the week's flagship event is to scroll through the list of 'Special' tournaments, looking out for an entry with the name 'Sunday Million'. At the time, PokerStars already had a basic filtering system in place so that users could hide specific games they weren't interested in. For example, to hide Omaha games the user could uncheck the box marked 'Omaha', and users could check another box so that only tournaments that were currently registering or upcoming were shown. But with thousands of upcoming tournaments at any one time, this was of limited use. 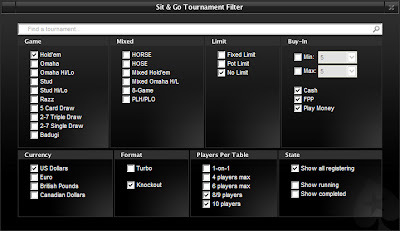 While designing the upgraded filter, I made obvious improvements such as allowing the user to filter out specific game formats that didn't interest them (like Turbo tournaments), and some less obvious ones like preventing the player from being able to enter filtering combinations which would have always returned no results. But possibly the biggest lightbulb moment came as a result of playing around with Windows Vista's search feature. In Windows Vista, the start menu has an integrated search function. You can open the start menu and start typing, and results are shown in real time as you press each key. Microsoft has improved this further in Windows 7 and 8, to the point where you can now open a program or file with as little as three key strokes (for example, opening Word is as simple as pressing the Windows key, followed by 'W' and then Enter). Many tournaments on PokerStars, including all of the flagship events, have names. I realised that with a similar type of search mechanism to Windows Vista, you could find a specific tournament like the Sunday Million with trivial ease. All you'd have to do is start typing the word 'Sunday', and voilà, there was your tournament. With the addition of a boolean NOT to remove keywords that you were not interested in, this became a very powerful feature. This is the index for a series of posts which will come together to form a portfolio of the features I have worked on over the course of my career in software design. In my time in the industry, I have led the development of new software features at PokerStars and Full Tilt Poker, the two largest poker rooms in the world. The features I have designed reach an audience of hundreds of thousands of unique customers every day. Although I've been designing and programming games my whole life (starting with text-based adventure games in BASIC and then side-scrolling platform games in Klik & Play and The Games Factory as a kid), I fell into designing features for PokerStars by accident. I'd shown an interest in new software features and had experience in interaction design from University, so I was given the opportunity to design a number of small features - which eventually developed into a career. Over the course of my career I have worked on hundreds of software features for PokerStars, Full Tilt Poker and others. However, for some of these features I simply led the design team. I'm only including features in this index if I conceived the idea myself, or was substantially involved the design and/or implementation of the product. One final note - due to the unfortunate events of 2011, many of the features that I conceived and designed at Full Tilt Poker have not yet been released. To preserve the confidentiality of these projects they will not be included here until they are publicly announced. I recently read an article in another magazine by Simon Burridge, the CEO of Virgin Games. In the article, Burridge laments the fact that gambling businesses are often perceived by the public and portrayed by the media to be dirty and evil, despite the fact that the gambling industry has much tighter controls than other ‘vice industries’, such as the alcohol and the tobacco businesses. For example, you can self-exclude yourself from a chain of bookmakers if you are a problem gambler, but can you self-exclude yourself from purchasing alcohol at Tesco if you’re a problem drinker? Burridge also argues that the National Lottery is unfairly perceived as more reputable than other types of gambling (especially casino games), and doesn’t have the same stigma attached, despite the fact that it is available to children as young as 16, from a diverse range of outlets, with no control to prevent problem gamblers from taking part. There is a difficult truth to gambling and other so-called ‘vice industries’ however. Any business, be they a clothes retailer, an eBay seller or a car dealership, wants loyalty and repeat business. The easiest way to assure repeat business is to have a product that your customers can become addicted to – which is something that the alcohol, tobacco and gambling industries have – but of course the social consequences of addiction are extremely severe. What is unique to the ‘vice industries’ is that we must find a way to retain customers and ensure repeat business without causing addiction. While I strongly agree with Burridge that the gambling industry’s controls are significantly stronger than those of alcohol and tobacco, and that the public’s perception is extremely unfair, I also believe that there is more that we can do, and that frankly the responsible gaming systems of even the best operators today are still only in their infancy. Today’s responsible gaming methods are mostly retroactive, which is probably because online gaming operators have a difficult quandary to resolve – on the one hand, we must not accidentally exclude good customers with responsible gambling habits; but on the other hand, we must be seen to give problem gamblers help and the tools to control themselves. The problem with retroactive methods is that the player is already experiencing a problem by the time they are exposed to the controls. For example, by the time a player reaches their deposit limit or table limit, they have probably already lost a sum of money which would be considered highly significant to most people; and using the self-exclusion tools requires a player to first admit that they have a problem and should take a break from the games. What I’m going to suggest is not an expansion of retroactive methods (although, as I have argued for security purposes, I believe that competing companies should work together to share a blacklist of self-excluded players), but the introduction of proactive methods that would allow us to detect the signs of problem gambling before the player caused themselves significant harm. In the online sector we are uniquely positioned to do this as we have access to a wealth of information about a player’s financial and playing habits, and can easily process this data en masse. The benefits to detecting a problem gambler early are obvious. First and foremost, protecting players who are at risk is simply the right thing to do. By stopping somebody early, you might prevent them from harming themselves or others, and you might be able to offer them help and advice that will help them to control their addiction. If nothing else, this should help you sleep at night. Stopping problem gambling early also helps safeguard the reputation of your brand, and the entire industry, in particular by guarding against the type of media stories that we see all the time in the Daily Mail, of people who destroyed their families by running up gambling debts that they couldn’t afford. Another less obvious benefit to detecting a problem gambler early is that you can guard against fraud and chargebacks. Problem gamblers are much more likely to chargeback on transactions as their losses inevitably mount, and are also more likely to attempt to use credit cards belonging to other people to finance their addiction. Detecting a problem gambler early ideally allows you to prevent such issues in the first place, but at the very least allows you to implement greater security controls and perform KYC checks in advance of any problems rather than cleaning up afterwards. But how do you detect problem gambling proactively, without negatively impacting players who are able to gamble responsibly? Simple – you look for the tell-tale signs. 1 Do you lose time from work due to gambling? 2 Is gambling making your home life unhappy? 3 Is gambling affecting your reputation? 4 Have you ever felt remorse after gambling? 5 Do you ever gamble to get money with which to pay debts or otherwise solve financial difficulties? 6 Does gambling cause a decrease in your ambition or efficiency? 7 After losing, do you feel you must return as soon as possible and win back your losses? 8 After a win do you have a strong urge to return and win more? 9 Do you often gamble until your last pound is gone? 10 Do you ever borrow to finance your gambling? 11 Have you ever sold anything to finance gambling? 12 Are you reluctant to use gambling money for normal expenditure? 13 Does gambling make you careless of the welfare of your family? 14 Do you gamble longer than you planned? 15 Do you ever gamble to escape worry or trouble? 16 Have you ever committed, or considered committing an illegal act to finance gambling? 17 Does gambling cause you difficulty in sleeping ? 18 Do arguments, disappointments or frustrations create an urge within you to gamble? 19 Do you have an urge to celebrate any good fortune with a few hours gambling? 20 Have you ever considered self - destruction as a result of your gambling? These questions can give us clues as to the type of behaviours to look for. The fact that the list contains 20 questions, of which problem gamblers are expected to answer with 7 or more with ‘yes’, also suggests that detecting only one type of behaviour probably isn’t enough. Instead, as with the detection of collusion, bot use, and other types of unethical play, detecting problem gambling is best done by automatically searching for multiple types of behaviour, scoring each one, and then flagging the highest-scoring accounts for manual investigation and follow up by a trained professional. · Unhealthy Session Times: The Gamblers Anonymous questions suggest that playing during working hours (question 1) or playing when you should be sleeping (question 17) are signs of problem gambling. A simple way to detect this would be to look for players who are playing during the typical working or sleeping hours in the country that they are based in. For example, in the United Kingdom, a player who plays at 3pm on a Monday afternoon will typically be playing in working hours, and a player who plays at 2am on a Thursday morning will be playing in normal sleeping hours. These types of session, when combined with other factors, could be indicative of problem gambling. · Unhealthy Session Length: A player who plays excessively long sessions is clearly not playing responsibly, and Gamblers Anonymous suggest that gambling longer than planned (question 14) is a sign of problem gambling. So scoring a player progressively based on the length of their session (i.e. a 14-hour session scores higher than a 12-hour session) could be a good way to identify unhealthy playing habits. · Destructive Playing Habits: The Gamblers Anonymous questions identify several types of destructive playing habits. For example, a player who plays until their account is empty is effectively answering ‘yes’ to question 9. A player who loses all their money and then immediately deposits to try and win it back, or who chases their losses by moving up in stakes, is answering ‘yes’ to question 7. Even moving up in stakes after a big win could be indicative of a problem. · History of Self-Exclusion: A player who has a history of excluding themselves or imposing betting limits may be experiencing remorse over their gambling (question 4 of the Gamblers Anonymous questions). Such a person may suspect that they have a problem but be having difficulty controlling it – something which they could use your help with. · Indicative Chat: As any experienced operator will know, players make some very extreme admissions in the chat – everything from suicide threats, to sexual fantasies, to gambling problems. Monitoring the chat for certain key words and phrases associated with an unhappy home life (question 2), remorse (question 4), or problem gambling generally could help to identify players who are having difficulties. · Financial Habits: Monitoring the financial habits of your players can help you to detect tell-tale signs that something might be wrong. A player with a history of chargebacks is more likely than usual to be a problem gambler. A player with a large number of failed deposits, or any attempts to deposit with a card belonging to another person, could be indicative that a player is turning to fraud to fund their habit (question 16). Similarly, receiving a large number of inbound transfers from other players could indicate that the player is borrowing money from friends to finance their gambling (question 10). As should be obvious, few of these factors are strong indicators of problem gambling when seen in isolation. For example, a player receiving lots of inbound transfers could simply be being staked, and a player who plays at 3pm in the afternoon could simply be unemployed, retired, or a professional gambler. However, in combination with each other, these indicators can add up to make a convincing case. It can’t hurt to call a player on the phone if they are showing some of the signs of an impending problem, and check that everything is alright. If doing so prevents even one player from experiencing the nightmare of a fully-fledged gambling addiction, it would be worth it. The past year has been an annus horribilis for the online gaming world, with the actions of the United States Department of Justice acting as a catalyst to the downfall of some of its biggest brands, millions of dollars of player funds remaining in perdition, and an ever rising mistrust for the businesses that comprise the online poker industry. But it has also been an unprecedented opportunity for smaller online poker rooms to break out and make themselves a big success – with the goliaths like PokerStars and Full Tilt handicapped by Black Friday and it's repercussions, there hasn’t been a market as ready for the taking since 2006. Despite this opportunity, not much has changed and the top spots remain in roughly the same order. PokerStars remains the giant it has been for the past five years, and is distantly followed by the Party Poker and iPoker platforms, fighting over the runner-up spot. Much has been written over the past year about what made PokerStars and Full Tilt the dominant players in the market. There has been a tendency among some to cite unfair competition – the fact that these sites could remain in the US, literally rake in the cash, and then utilise that money to finance their expansion into Europe. The publicly listed operators in particular seem to constantly blaming the ‘US-facing’ sites for their woes, with the CFO of bwin.party, Martin Weigold, going so far as to remark that they needed to see PokerStars ‘shutting down’ before they would benefit from the events of the past year. However – is this really all about money? After all, it’s not like bwin.party is short on cash – this is the company which was valued in 2011 at over $2 billion USD, which has some of the strongest brands in the market (think PartyPoker and the World Poker Tour), and which has several revenue streams like casino and bingo which a company like PokerStars doesn’t have. Perhaps it’s now time to stop making excuses about unfair competition, and instead of analysing what made PokerStars a success, analyse what it is that has caused some of the ‘euro sites’ and networks to underachieve so much. Is it harsh to say that a company like bwin.party is an underachiever in poker? Personally, I don’t think so. In 2006, Party Poker, then the group’s flagship brand, was the biggest online poker site by a significant margin. The site was well-known for its juicy games and generous bonus offers, ensuring it was packed with recreational players and serious players alike. Having just floated on the stock market and raised around a billion pounds for its owners, the company had plenty of money to reinvest and grow the business. Then the UIGEA hit, and Party made the cautious decision to withdraw from the US market, losing the majority of its customers overnight. This was a turning point for the company, and the decision was understandable given that the company was publicly traded and investors had been concerned about US legal intervention even before its IPO. But what weren’t understandable were the company’s actions after the UIGEA. By withdrawing from the US voluntarily, Party left a gap in the market for other operators. At this point, the sensible thing to do would have been to invest in development of the business – either to plug that gap in the USA with an alternative product such as subscription poker or a Zynga-style monetised social game, or to develop the business elsewhere by investing heavily in marketing to emerging markets like Germany and Russia. But Party did neither – instead, they took their now greatly-reduced player base and diversified into new products like casino, bingo and backgammon. Not only did this kill of much of the company’s poker liquidity at a time when poker was its biggest vertical, it reduced the marketing budget that was available to poker. Gradually, the company shifted from being entirely poker-centric to earning less than 30% of its revenue from poker in 2010. To single out bwin.party would be unfair, however. There are plenty of similar companies out there, many of them also publicly traded, that have failed to capitalise on the opportunities available to them post Black Friday and in general. But what do these companies have in common that has caused them to underachieve? First could be the tendency for these companies to undervalue poker expertise. I’ve written about this subject before for InsidePokerBusiness, and I feel strongly that in order to succeed in the online poker business, your company needs to recruit people who are passionate about the game and teach them to be businesspeople (if necessary), rather than taking businesspeople and teaching them poker. Ideally, a poker company would have a mix of highly passionate and knowledgeable poker enthusiasts, and experienced businesspeople – this type of culture ensures that both types of employee have something to learn from the other. However, the underachievers prefer to spend their money on hiring transient CEOs and non-executive directors, and place too much emphasis on experience in business and not enough on passion and knowledge of the product. It seems almost inconceivable that you would hire a head chef who didn’t enjoy food, or a bank teller who couldn’t count, but the underachievers will happily place somebody who has never played a hand of poker in the most senior of roles. Another possible cause could be a tendency to underinvest in software. A clear example of this has emerged after the closure of Full Tilt Poker on June 29th – which took with it the popular Rush Poker product. At the time of writing (February 2012) Full Tilt has been closed for eight months and the only competitor that has announced it is developing a competing product is… wait for it… PokerStars! How the underachievers could miss such a major opportunity is beyond me*. But the biggest and most fundamental mistake the underachievers make is failing to realise that at its core, poker is a game of liquidity. If you have two players, you can have only one game running. But if you have three players, you can have three games running – Player 1 vs Player 2, Player 1 vs Player 3, and Player 2 vs Player 3 – you’ve increased the number of players by 50%, but liquidity by 300%. With one thousand players, you have upwards of 20,000 potential games (assuming there are reasonable restrictions in place as to the number of tables each player can play at once). Each active player that you add to the ecosystem has a disproportionately positive effect on the number of potential games, especially if your site is small. Therefore, it’s a big mistake to hurt this liquidity by spreading it across too many stakes, currencies, and products – but this is something the underachievers all do in spades, especially by chasing the easy money in casino and bingo. It’s also a mistake to undervalue your serious, winning players – as these are the players that are most likely to start games and build your liquidity. The recent trend towards penalising winning players amongst the underachievers is likely to hurt them more than it helps. This is not a rant – it’s a call to action at a time when the online poker industry needs an injection of competition and innovation to prevent it from becoming stagnant. It’s time to stop making excuses and face up to facts – has your company been an underachiever? If so, get out there and make a change. This article originally appeared in InsidePokerBusiness, Jan-Feb 2012. *After this article was published, bwin.Party, iPoker and Microgaming all announced their own versions of Rush Poker with various different names.